Log into your Image-Line Account (click here to create a free account) and download the Square-a-Saw FL Studio demo project as used in the video outro, and featured below - right here. Includes some free VeelaVocal Presets. LollieVox Vocals Resynthesized is a unique pack of presets for Harmor taking resynthesis to the next level. It is one of the fastest and easiest ways to add pitchable vocals to any project. Choose from 95 four bar vocal phrases, sung by LollieVox, and play them in real time on your keyboard or from the Piano roll, in whatever pitch, chords or tempo you like. The acclaimed Harmor synthesis and FX engine is at your disposal to manipulate the vocals in ways not possible with conventional samplers or pitch editors. Formant correction & time-stretching are performed automatically, in real-time, so notes will not create the 'chipmunk effect' or increase or decrease their speed, unless you want them to. Vocal phrases automatically sync to your project tempo and bar time or can be set to restart on each note as with normal samplers. Use per note X and Y modulation in FL Studios Piano roll to control vocal phrase start position or formant shift individual notes. Lower the formant to create masculine vocals or raise it to make them sound like a child. Apply custom vibrato at any time by automating the depth and speed parameters. Drag and drop any of the 95 pitch flattened source vocal samples onto any one of 25 special Harmor presets giving 2375 possible combinations. Presets include robotic vocoding, sustained pad sounds or mutated formants. Don't own Harmor but want the vocals? No problem, you can get the standard LollieVox sample pack here. The LollieVox sample pack is now available for just $29 USD. Great news for owners of the Laurie Webb Vocal CD, the new content is a free update to the discontinued Laurie Webb CD. Check it out here. 115 Melodic vocal loops written and sung by Laurie Webb. 62 Melodic vocal loops written by a selection of FL Studio users and sung by Laurie Webb. 590 Bonus one shot vocal samples (same content as discontinued Laurie Webb Vocal CD). 115 loops are at a tempo of 120 BPM, mostly 2 to 8 bars in length. In the musical key of C Minor Natural/Aeolian. Compose your music with the notes C, D, D#, F, G, G#, A# to match. 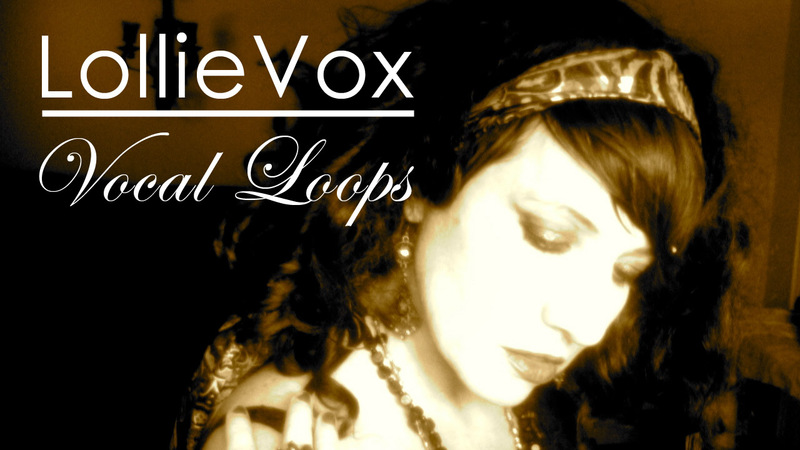 62 loops are at a tempo range from about 100 BPM to 140 BPM in different musical key. Built in tempo information means automatic time stretching as Audio clips when they are drag and dropped to the playlist of a project. 16bit 44.1 kHz .wav format. Tip: Set Audio clips to Monophonic time stretching mode if needed. Use NewTone to adapt to other keys.